London Green Left Blog: Could the UK be Self-Sufficient in Food After Brexit? Could the UK be Self-Sufficient in Food After Brexit? With stories circulating about the British government stockpiling food, as part of a plan to cover the eventuality of a no deal Brexit, there is talk that the UK should become more self-sufficient in food once we leave the European Union (EU). Of course all this would take time, certainly longer than by our exit from the EU, which will happen in eight months’ time. But as a longer term objective, this would surely be a sensible thing to do. It would avoid tailbacks at ports and environmentally concerned people should welcome it, too. But is it feasable? Britain has not been self-sufficient in food since the eighteenth century (when all of Ireland was included), and even then some foods were imported. During world war two the country was close to being self-sufficient in food, but rationing was introduced in 1940 and didn’t fully end until 1954. Some lessons might be learned from some of the practices employed, especially making more land available for farming, from this emergency period. According to the UK government’s figures, in 2016, Britons consumed only 49% of the total food and drink consumed in this country, from UK food sources. Of the other 51%, by far the biggest imports (30%) came from the EU. Some of the food produced in the UK is of course exported, but this only amounts to about 25% of the total produced. So, even if we stopped exporting food, we would still have about a quarter of what is needed to make up. The trade deficit in food, feed and drink increased in 2016 to £22.2 billion, up from £20.9 billion in 2015. So replacing this amount of imported food would take some doing, but I think it is possible to get close to it. It will require a massive restructuring of UK farming in particular though, but it would also need a complete change in the culture surrounding food consumption, from the British people themselves. We have become so used to getting unseasonal food when we want it, and have long had a taste for fruit, tea and coffee, that is difficult to grow naturally in the British climate. Agriculture in the UK uses 69% of the country's land area, (43 million acres) but this includes land used for growing biofuels. It is certainly possible, with the will, to increase this amount land with more small holdings, in cities and towns, and people could be encouraged grow their own food in gardens and allotments. Organic farming in Cuba has moved in this direction since the collapse of the USSR, when chemicals and pesticides stopped being provided to Cuban farmers. Britain is an island of course, and so has access to fishing, and we don’t eat nearly enough locally caught fish at the moment. But people’s tastes have moved towards warmer water fish, like tuna and monkfish, myself included. There would certainly be extra capacity in UK off shore fishing, but will people want to eat it? In world war two just about the only food that wasn’t rationed, was fish and chips, but people got fed up with rationing generally. That was over sixty years ago, and much has changed in food fashions since then. There is no doubt, that a vegan, vegetarian, pescatarian or even low meat diet would make food self-sufficiency much easier to achieve. Beef and dairy farming especially is an unproductive use of farming land. But again, the popular food culture of Big Macs etc, make for a huge barrier to reducing the demand for beef products. 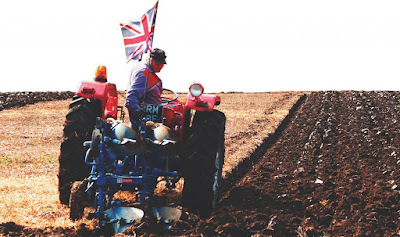 With the average age of a farm owner now 59, and with the difficulties getting crop pickers etc as we leave the EU, it doesn’t look as though the British like farming much anyway. I can’t see why we couldn’t be more self-sufficient while remaining within the EU, since we sell off 30% of our fishing quota to all bidders now, for example. Brexit may well force this issue onto the agenda though, but is self-sufficiency in food the likely outcome? I have to say I think not, at least in the medium term. People want things to carry on exactly as they have done. The demand will be filled mainly from North America, Australia and New Zealand, (probably with lower hygiene standards) rather than from our closest neighbours, Ireland, France and the Netherlands, as currently. There is no reason why ecosocialists and greens should not campaign for more food self-sufficiency, but we should at least recognise that it is a mountain to climb, mainly because of the British people’s prevailing cultural attitudes to food. It would be easier to keep our existing arrangements with the EU, but that may not be possible. Too many times angry vegans put people off. Of course vegan activists do argue and promote the health benefits, but many times, veganism is sold as a very urgent "Think of the animals!". with a focus on not eating meat. Many people won't be able to make the switch overnight or even go completly vegan. But if they are eating stuff that they really like, that just happens not be meat, then the amount of meat eaten would be way less. I love Huel. It also covers UK self-sufficiency and is every prepper's dream! It has been calculated that all Scotland's food needs could be grown on an area the size of Fife. I don't know how that would scale up to the whole UK. Too much land is taken up with grouse moors and crops for alcohol. We need more incentives for farmers to grow vegetables for local consumption. Also more home grown food. After all you 'can't eat a lawn'! Good vegetable and fruit gardening is much more productive per area of land than the most efficient extensive farm. I'm not a vegan, but a vegan once told me that if good chefs took it seriously, then it would be more appealing. Maybe, but I do like cheese and fish, and some meat. Hottest Four Years Ever? 2015. 2016. 2017. 2018? Can Housing Struggles lead to Ecosocialism?